Congratulations to Nenad Medic, Event #1 Champion! Nenad Medic overcame a 352-player field that boasted some of the biggest names in poker to take down his first World Series of Poker bracelet. "It was a tough field, the whole tournament, all the way to the final table...I always had a decent stack. The ace-king versus kings -- I didn't feel too good about that, but it worked out," he said to ESPN's Norman Chad in his post-victory interview. 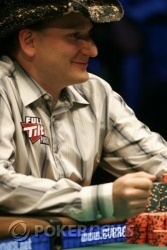 "Do you feel guilty at all about beating Andy Bloch heads-up on his birthday?" queried Chad. "Not at all," said Medic with a sly smile as he picked up a brick of cash and smiled for the throng of photographers. Nenad Medic has the button. He calls, Bloch raises to 300,000, and Medic calls. The flop is . Bloch bets 500,000, Medic re-pots, and Bloch calls all in. It's the overpair against the monster draw as we go to the turn. It's the and Medic makes his flush, but Bloch has a higher flush draw, holding the . But it is not to be for Bloch tonight. The river is the , and Nenad Medic wins Event #1, the $10,000 Pot-Limit Hold'em World Championship, capturing his first bracelet and $794,112! 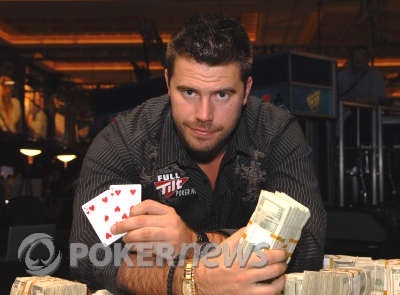 Andy Bloch is our runner-up and earns $488,048 for his finish. Andy Bloch has the button. He gives Medic a walk. Nenad Medic has the button. He raises to 300,000 and wins the blinds. Andy Bloch has the button. He raises to 300,000 and Medic calls. The flop is . Bloch leads out with a pot-sized bet, inducing a fold from Medic. Nenad Medic has the button. He raises to 300,000, Bloch reraises all in, and Medic calls. The flop is and Bloch takes the lead with a pair of queens. The turn is the , the river is the , and Bloch gets a much-needed double-up to 1,240,000. The crowd immediately begins serenading him again with "Happy Birthday" as he rakes in the pot. It was pointed out again that today is Andy Bloch's birthday, and the crowd gave him the expected round of applause. And then, starting with his fans and spreading throughout the room, the crowd serenaded Andy with a brief version of "Happy Birthday." Andy Bloch has the button. He calls, Medic raises to 300,000, and Bloch calls. Medic makes a pot-sized bet in the dark before the flop comes down . Bloch folds and Medic wins the pot.